Cambridgeshire constabulary are encouraging residents to get involved in our force burglary initiative: officers and staff will be on hand to provide security advice and information for anyone who would like to come along. There will also be security products available at a discounted rate, as well as property coding. Neighbourhood officers will be patrolling and visiting local streets during the event, to increase security awareness as the darker winter evenings are known to be linked with increased burglary rates. Come along to meet your local policing team and find out more. Cambridgeshire constabulary are encouraging residents to get involved in our force burglary initiative: officers and staff will be on hand to provide security advice and information for anyone who would like to come along. There will also be security products available at a discounted rate, as well as property coding. 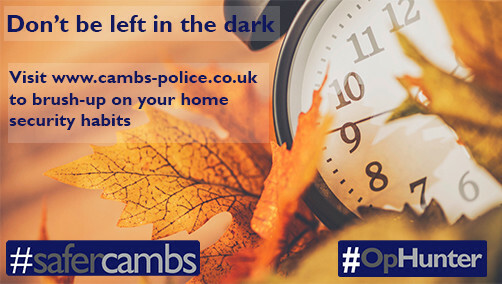 Neighbourhood officers will be patrolling and visiting local streets during the event, to increase security awareness as the darker autumn/winter evenings are known to be linked with increased burglary rates. Cambridgeshire constabulary officers and staff will be providing security advice and information for anyone who would like to come along. Simple security gadgets will also be available to buy at a reduced rate. Do drop in to find out more. Constabulary cadet officers will be patrolling and visiting local streets during the event, to increase security awareness as the darker autumn/ winter evenings are known to be linked with increased burglary rates. Light up your home and make it less attractive to burglars.